Racist persecution of the Nigerian mother in Posseck (Vogtlandkreis) after the first protest of The VOICE Refugee Forum and Caravan for the right of refugees and migrants in Germany against the hand chaining of the children and their brutalisation by the police in May 2008. After the nationwide protest against the police abuses of the children who were brutalised and in hand chain deported back from the AWO-Kinderheim to the isolated refugee camp in Posseck, there have been different forms of collaboration and intransparent manouverings between the judiciary, the Jugendamt, the foreigners authorities and the childrens home to criminalise and to further isolate the family. The court legal decision to refuse the legal adoption of the three children from the Nigerian mother was never communicated till this week in any form by the the family - Guardian court to the Nigerian mother nor to her lawyer. Due to the public pressure on the Vogtlandkreis, as a result of the protest campaign, they started to develop their defamatory propaganda machinery against Claudia, the nigerian mother, as a prostitute, as children trafficker and to intensify the racist brain washing for psychological intimidation and torture of the children to hate their nigerian mother and auntie. Claudia said that all allegations do not worry her because she had heard enough of them, that they cannot prove any of the allegations to be true. "They have only succeeded to keep us in the refugee isolation camp in Posseck for more than 2 years before i knew The VOICE Refugee Forum in the beginning of this year." We have been informed that since August this year, that the positive decision by the court on the asylum for all the five family members has been granted, the authority officially accepted in principle but every effort made by claudia to get a house for herself and the children have always been aborted without success in Reichenbach. We are well informed of the daily persecutions and the maltreatments of refugees including Claudia Omoroghomwan and her children in the German isolation camps in Posseck since the past 4 years she arrived in Vogtlandkreis/Sachsen. Instead of the Vogtlandkreis to conduct an examination of the children's traumatisation after the brutalisation by the police, they preferred to isolate the children from their mother and the public to cause more damages to the family. We are also seizing this opportunity to express our trust in the consistent support of the caravan activists to strengthen the solidarity that have kept the struggle of Claudia's self determination to fight to keep her children and to dennuoce the maltreatment of the refugees in the isolation camps in Posseck. 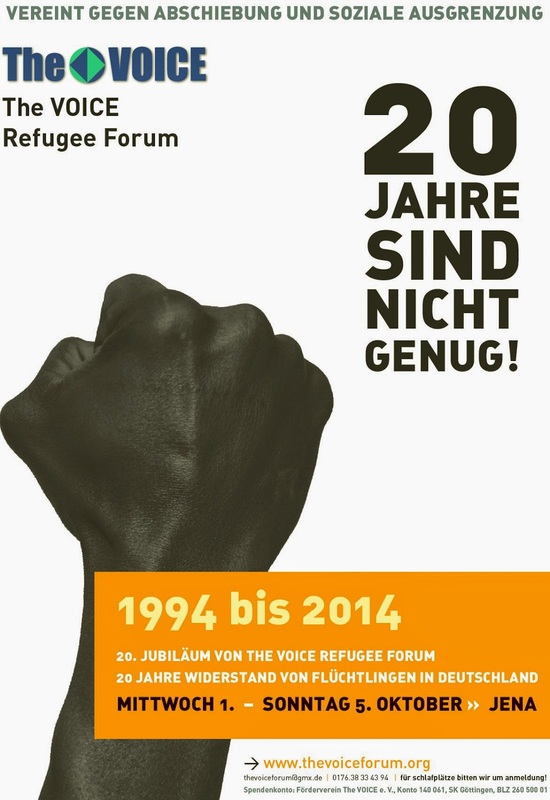 "Claudia' family is just one of the very few refugees who have the courage to speak out against her inhuman treatment, the racism and the discrimination by the maltreatment of the refugees in the German isolation camps in Posseck and Vogtland Kreis, for which she is being criminalised and persecuted. She deserves our support and solidarity." Osaren Igbinoba"
We demand apology and compensation for the family of Claudia! The protest is growing and we will hold to it, we are only appealing to the conscience of all peace loving people in the world to stand against the inhuman treatment of refugees in Vogtlandkreis and the racist foreign authorities there. Please see the links to our solidarity initiatves. Our best regards in solidarity and peace with the family of Claudia Omoroghomwan.